In late September 2016, our family had to say a very tearful goodbye to our sweet Miniature Schnauzer, Callie. Callie was nearly 13 yrs. old and for the last three years of her life, she dealt with a few major health issues. Callie was quite intelligent, a bit stubborn, very comical, but most of all, she was sweet and loving and we all loved her so. I searched for other resources to help me cope and try to understand that if what I was feeling was normal and how long would this terrible pain last. 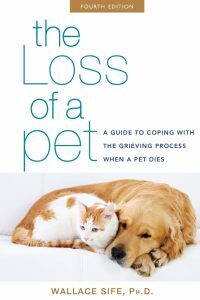 I found a wonderful book, “The Loss of a Pet”, authored by Wallace Sife, Ph.D. Dr. Wallace Sife, Ph.D. is a nationally renowned authority on Pet Loss and Bereavement. I found great comfort in reading this book, but I felt like I needed more. I had a wonderful support system, my husband was wonderful to talk with, but he too was suffering the loss and I felt guilty depending on him for emotional support. I needed to find someone who could solely focus on me. I was fortunate that I have a wonderful family and friends who were always willing to listen to me, but they had lives of their own. One of those friends, who is and has been a veterinary professional for over twenty years suggested that because I had learned so much from my research and personal pain, I should investigate the possibility of becoming a counselor for those who are suffering with the loss of their pet. I wondered if this profession even existed. Well, I did my research and found it certainly does exist. I researched and found many schools, organizations and associations that offer classes and courses in Pet Loss and Bereavement Counseling training. I was very impressed with the Association for Pet Loss and Bereavement and the integrity that surrounded this prestigious association. I was fortunate to be accepted into their counselor training program and was trained and certified as a Pet Loss and Bereavement Counselor in September of 2017. I began this journey as a tribute to my sweet Callie and as a way to help myself learn how to cope with the unrelenting pain and sadness that you feel when you lose a beloved pet. I continue this journey with determination to help other grieving pet owners who are suffering with the loss of a beloved pet. There is no reason you should ever suffer alone, I am here to help you. Understanding helps heal the hurt when you lose a pet. This award-winning book has been hailed as the seminal work in the field. And now the fourth newly revised and expanded edition offers so much more to the bereaving pet owner. This edition also includes a significant new way of considering the meaning of afterlife for us and our pets. It discusses the topic from a twenty-first century scientific perspective that is very different from existing religious or metaphysical ones, offering a new comfort to skeptics and agnostics as well. And there is a special chapter at the end, offering helpful hints and suggestions.